Forgot your password account of Pidgin? 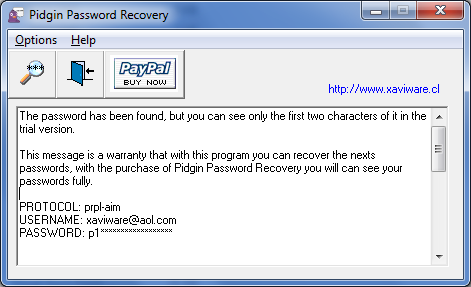 Pidgin Password Recovery is a tool that can help you. Pidgin Password Recovery is a software that can find all the accounts on Pidgin in your computer, extract passwords and show. Pidgin Password Recovery is instant messaging program that allows to configure and use MSN Messenger accounts simultaneously, Windows Live Messenger, Yahoo! Messenger, AOL Instant Messenger, ICQ, Jabber, etc. ...... if you do not remember your passwords to your accounts, Pidgin Password Recovery can recover! Trial period is endless. You will recover only the length of your passwords while program is trial period. Password will be fully recovered after purchasing the program. Qweas is providing links to Pidgin Password Recovery 1.0.2 as a courtesy, and makes no representations regarding Pidgin Password Recovery or any other applications or any information related thereto. Any questions, complaints or claims regarding this application Pidgin Password Recovery 1.0.2 must be directed to the appropriate software vendor. You may click the publisher link of Pidgin Password Recovery on the top of this page to get more details about the vendor.